You may never have thought of it this way, but as the owner of a business you’ve become an expert in your industry, a valuable position that can help generate sales leads. 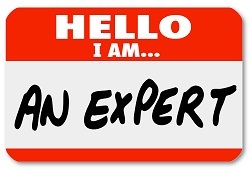 People look up to experts and seek their knowledge and insights to improve their lifestyle and business condition. Sharing consistent, relevant information in the right way – without making it too salesy or all about you – can boost organic web traffic and put you in front of the right prospective buyers. We live in an information world with lots of ways for consumers to do their homework before making a purchase. Producing newsletters, blogs, media coverage – even networking – can demonstrate your expertise and convince potential customers that your company offers the best option. Many consumers are tired of being bombarded with advertising and prefer to be educated rather than sold to. So it’s critical that you avoid the high pressure sales pitch and the industry jargon and buzzwords. Newsletters – Put a newsletter sign-up in every place that makes sense on your website. Deliver regular newsletters with your insights, customer success stories, promotions, and industry news. Look for ways to write about trendy or newsworthy topics that relate to your industry. Blogging – A blog is a great lead generator because it gives you complete control of content and the reader’s attention. Optimize your blog with a sign-up section for your newsletter and use the margins to promote your products and services. Publish the blog on LinkedIn. Write free guest blogs for websites in your niche. Media coverage – Register to become an expert resource for local and national media online. Reach out to journalists (print, broadcast, radio, or podcasts) and tell your story in a real, authentic and compelling manner. Come off as an expert in your area. Get influencers to talk about you. eBook – Write a short eBook with a neutral perspective and with actionable insights. Give away the eBook as a bonus for signing up for your newsletter or becoming a member. This is best for technology companies or businesses that sell to other businesses. Networking events – It’s not always what you know but who you know. Getting a chance to meet people face-to-face to provide tips, solutions, and cost-saving measures can turn solids leads into buyers. This entry was posted in Marketing, Sales, Small Business by Guest. Bookmark the permalink.